The idea of the URBAN COMMUTER ADIVA. 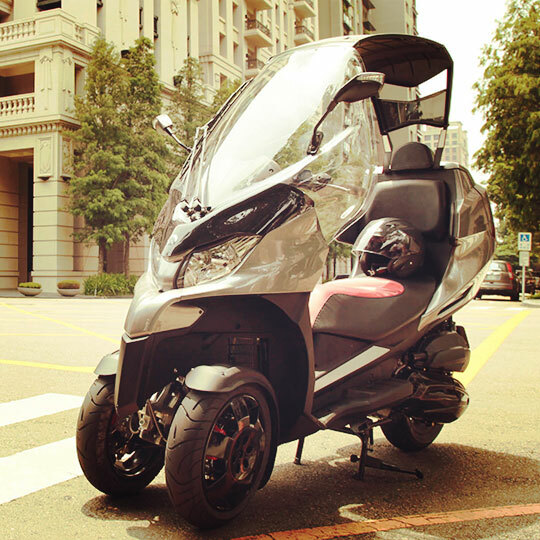 Easy to drive as a scooter, comfortable as a car is meant to invent a new vehicle which is more complete, safe, and versatile. The first adiva concept scooter was shown to Italian public and the international patent on the adiva foldable roof innovation was granted. At the same time the company started to gear up for the ambitious challenge to enter the market with Adiva own brand and corporate identity, based on innovation, trendy design, and passion. With great expectation by all the scooter fans, ADIVA released new three-wheel scooter AD3. The AD3 series promise excellent road holding in all weathers and greater safety when dealing with the problems of driving in big cities, such as tracks, cobbles and drain covers. The fact that they are closer to the ground, their suspension, an excellent chassis and two front wheels mean they can take corners more quickly and more precisely. Adiva also provides the electric scooter.